By default, Magento assigns a separate number to orders and related documents (invoices, shipments and credit memos). Once installed, this extension ensures that when a new invoice, shipment or credit memo is created, it will always take the same number as the associated order. 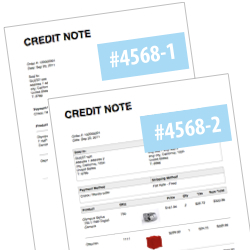 In the event of multiple invoices, shipments or credit memos associated with the same order, a duplicate separator will be used. For example, the first invoice would be #1000, the second #1000-1, the third #1000-2, and so on. This extension can be particularly useful for businesses that ship and sell high volumes of products. Your customer benefits by only ever having to reference one number consistently displayed on all documents. Want to take it further? Our Fooman Order Number Customer Magento 2 extension lets you fully customise order, invoice, shipment and credit memo numbers using any combination of letters, numbers and dates. Where can I find support for Fooman Same Order Invoice Number (M2)? •et; Or report a suspected bug via Github. Before reporting a bug, please make sure that you can replicate the issue on Magento’s default theme (with no other extensions installed), to rule out any issues caused by extension/theme conflicts). We may contact you if we have an immediate fix or a workaround, but we can't always respond individually to every report that comes in.